So let’s look at some facts – according to Irdeto data from late last year, there were more than 2.7 million advertisements on e-commerce websites, including Amazon, eBay and Alibaba for illicit content streaming devices. This, combined with the exponential rise in the number of illegal streams from peak live events where traffic multiples in a short space of time, creates a huge challenge for content owners and rights holders. As the threat rapidly evolves and grows, security strategies need to evolve in tandem. One proven method of detecting an illegal stream is to send out web crawlers to find any and all streams of a particular event and then to determine – by identifying the broadcaster logo and tracking validation back to source – whether the stream is pirated. If so, take-down notices can be issued to the offending ISP. However, the scale of live event broadcasts and illegal distribution is now so great that doing this manually is next to impossible. 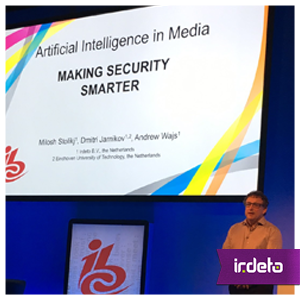 In the same IBC Conference session, Irdeto CTO Andrew Wajs outlined how Artificial Intelligence can play a key role in providing scale. There is a further problem which needs to be tackled though. The encoding and processing employed by pirates (or those simply using a camcorder) creates artefacts and often blurs the logo rendering recognition tricky. Therefore, the AI needs to be trained on just the right data set to be able to overcome this. Irdeto has trained its algorithm on two of the main industry standard neural networks (NN) known as AlexNet and ResNet as well as on its own NN, IrdetoNet. Irdeto says it combines this innovation with its proactive Cybersecurity Services to reach a new level in the fight against piracy. This entry was posted in Media & Entertainment and tagged artificial intelligence, online piracy, OTT piracy. Bookmark the permalink.